I knew a little bit about Bergen, Norway before my recent visit. For example, I knew Bergen was the gateway to the fjords, making it a convenient base for travels in the region. 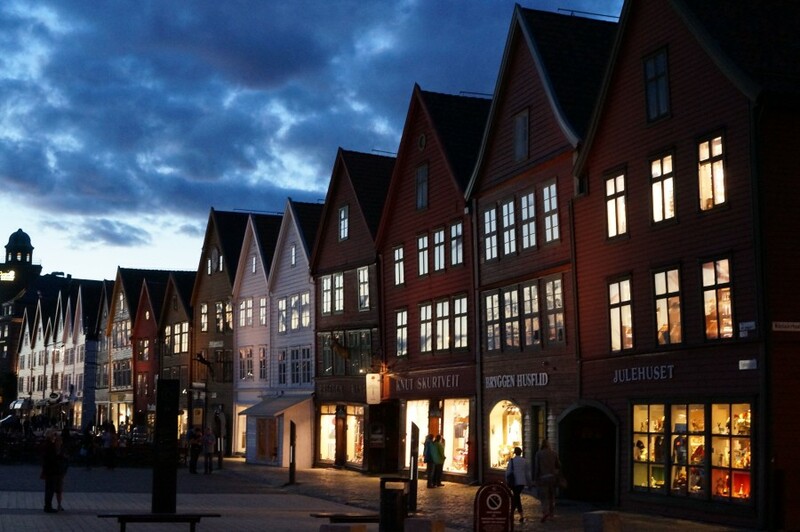 And of course I’d seen photos of those colorful wooden buildings lining Bergen’s wharf, known as the Bryggen. But I didn’t know how much I was about to regret planning such limited time in Bergen. Bergen charmed my socks off and I’m not even sure I can fully explain why. From the moment I stepped out into Bergen’s twisty streets, I starting dreaming of taking a week to hang out in its cute cafes and stroll its back alleys. There was just something about Bergen’s fantastic scenery, friendly people and laid back vibe that lulled me into vacation mode. The subject of endless photographs, the peaked roof buildings fronting Bergen’s wharf date back to the early 1700’s. While the original buildings have been rebuilt over the years after fires, the architecture remains the same. But it wasn’t meant to be, at least not for this visit. With only a few short hours to take in the town, I focused on the most iconic part of Bergen– the peaked roof shops of the UNESCO World Heritage site, the Bryggen. 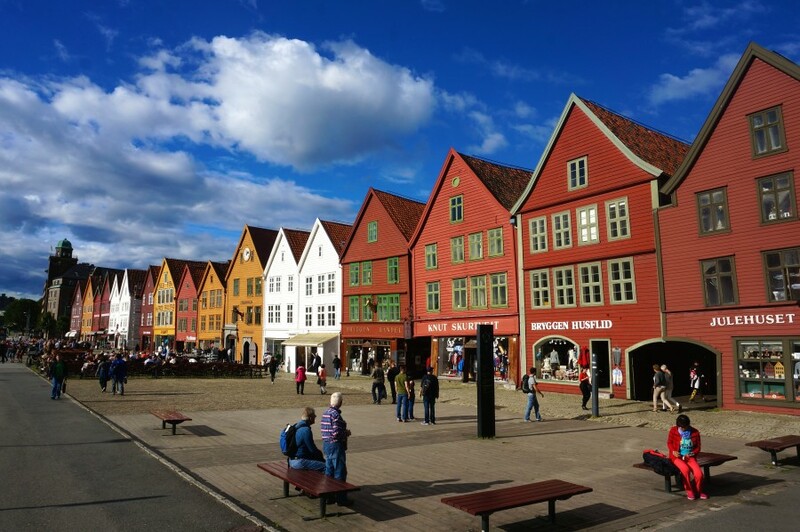 The Bryggen’s historic painted buildings have housed shops here for hundreds of years, so it made perfect sense to continue to support the long-standing tradition of shopping. After feasting at the Bergen Fish Market (read about it in my last post here), I set off on my Bryggen shopping expedition. 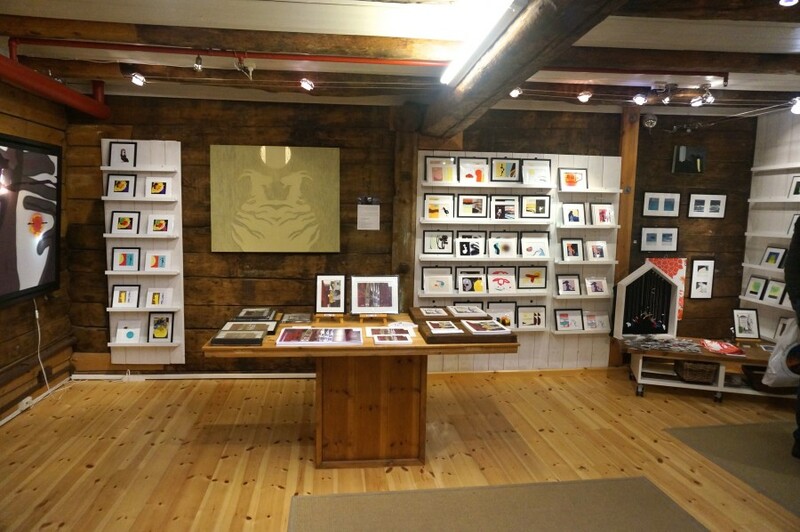 A word of warning: not every shop in the Bryggen carries handmade and original merchandise. In fact, many are chock full of the plastic trolls and viking tat you’ll find at any tourist-geared souvenir shop. 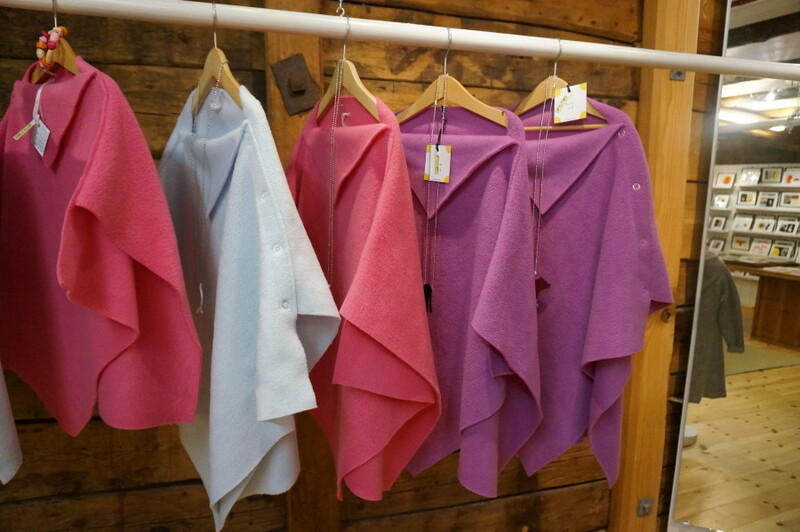 But if you keep exploring those back alleys, you’ll stumble upon all sort of interesting shops– everything from jewelry made by local Bergen artisans to handmade woolens to fishing specialty shops. As I was short on time, I didn’t make it to every shop in the Bryggen, but even with just a couple of hours to shop (and no guidebook) I managed to find plenty of souvenir possibilities. The askew alleys of the Bryggen. If you only stick to the main shopfronts, you’ll miss all the fantastic artisans who have set up shops in the alleyways connecting the main shop buildings. 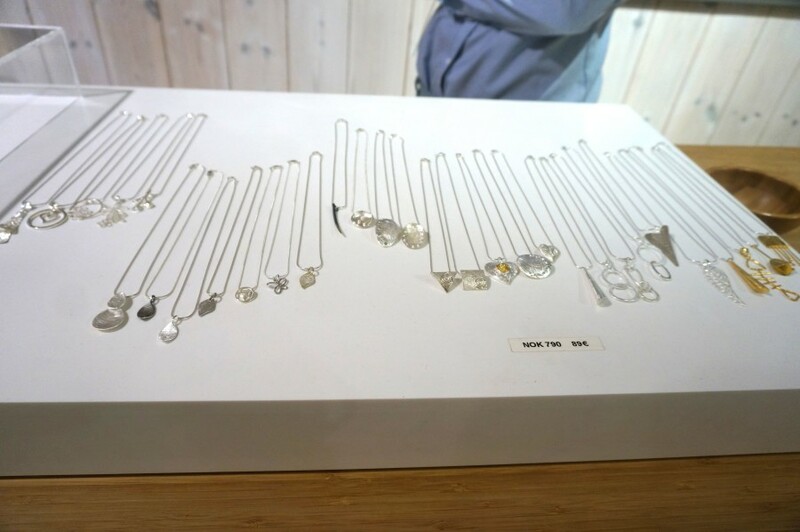 The Bryggen has many shops featuring locally made jewelry. While some of it was not to my taste, I adored the contemporary designs in other shops, including at the brand new boutique, Per Vigeland. Necklaces at Per Vigeland, Bryggen. Although I had some translation difficulties with the kind shopkeeper here, I did manage to make out that moose leather was desirable for its softness (which I later confirmed by touching the silky soft leather). According to the shop owner, the most popular items were the leather vests. I asked again to make sure I was understanding her correctly (I was). I personally preferred the roomy but classic handbags. I don’t know much about fishing but judging from the sheer variety of merchandise stuffed in this shop, I can only imagine it would be a dream for any fishing hobbiest in your group. If you can figure out how to get one of these wooden boats home, you’ll have a one-of-a-kind souvenir. There are many atmospheric and historic cafes scattered throughout the Byrggen. If you visit when the weather is warm (as it was the first week of September when we visited) there is nothing better than sitting at one of the outdoor cafes facing the wharf. I stopped at Baker Brun for a classic Norwegian pastry called a Skoleboller— a sweet bun filled with vanilla custard and dusted in coconut. 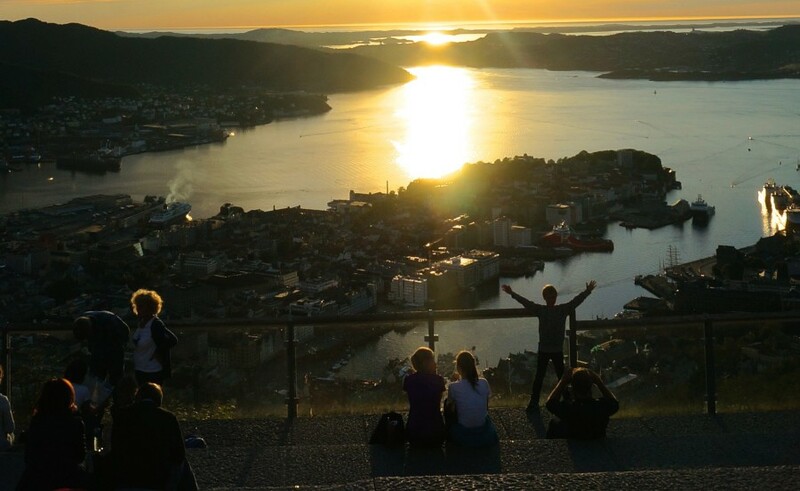 As the shops starting closing up, we headed up the funicular (included with the Bergen card) for an incredible sunset view of Bergen. The Bryggen is otherworldly at night– walking through the back passageways is especially romantic. 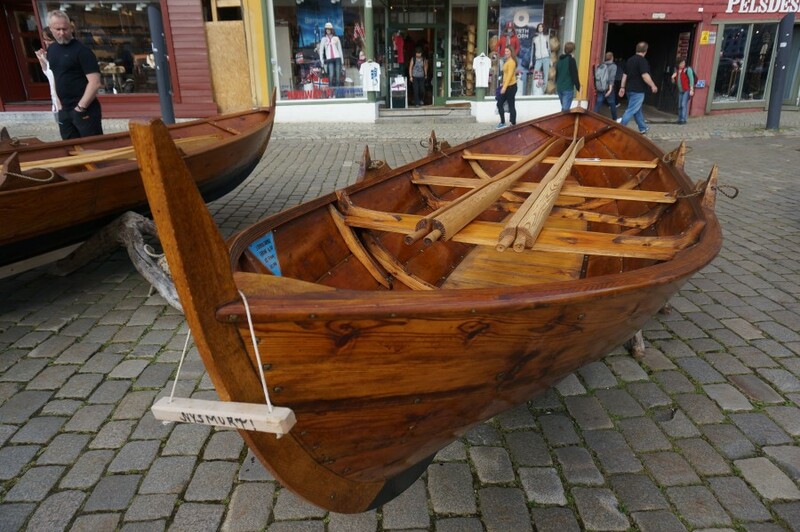 Have you visited the Bryggen in Bergen? What are your favorite shops and cafes? Disclosure: I was a guest of Visit Norway USA and its partners, but all shopping picks, as always, are my own. Love this article, Kristin. Thanks for sharing these tips and beautiful photos, I really enjoyed it all! I arrive there tomorrow. With only 3 days. With little time for shopping, I plan to use your blog as a shopping map to find a true Norwegian treasure. Thank you. Thanks so much 🙂 I hope it was helpful and you found something you love!